PhD student Lauren Downing Peters article "Performing Vintage: The Cultivation and Dissemination of Vintage Sensibilities at the Brooklyn Flea" was published in a special issue of The Canadian Review of American Studies (CRAS) entitled "The Aesthetics of Renewal; or, Everything Old is New Again." The journal emerged from a Canadian Association of American Studies conference entitled "The Aesthetics of Renewal" that took place in Ottawa, Ontario Canada in 2011. Abstract: “Vintage” as a fashion term is difficult to pin down. While some scholars argue that vintage only applies to fashion items that are at least twenty years old, others argue that it is also an easily manufactured and commodifiable sensibility. This article offers a revised definition of vintage as performance and bridges the fields of fashion studies, cultural studies, and ethnography. 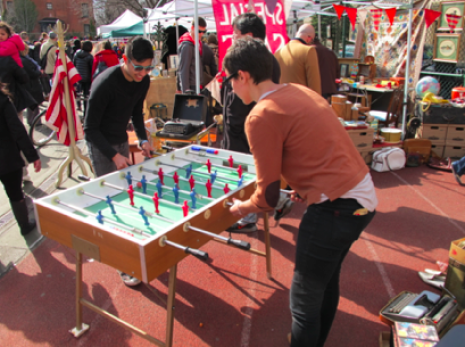 Using the Brooklyn Flea in Brooklyn, New York, as my primary research site, I use interviews and in-depth ethnographic observation to provide a new framework through which we can come to understand the Brooklyn vintage phenomenon and observe an example of aesthetic renewal in a vibrant consumption landscape. I suggest that, through this case study and through the lens of performance, we can come to understand vintage as produced in interactions between cultural actors (principally the consumers and purveyors of vintage objects) and disseminated by street-style photographers, who spread images of the flea online to the virtual viewing public.